GRAND HAVEN, Mich. – A Coast Guard helicopter crew from Air Station Traverse City, Michigan used the rotor wash from their aircraft to help clear a path for two fishermen who were pushed offshore aboard their 16-foot boat by wind and ice, and then became surrounded by the ice off Holland, Saturday. The Coast Guard is not releasing the names of the individuals. The Watchstander directed the launch of a boat crew from Coast Guard Station Grand Haven aboard a 47-foot response boat, and an aircrew aboard a Dolphin helicopter from Coast Guard Air Station Traverse City. Additionally, the officer-in-charge of Coast Guard Station Holland responded shoreside to maintain visual contact with the fishermen until the other Coast Guard personnel and assets arrived on scene. The boat crew transited south on Lake Michigan from Grand Haven for about 15 miles before they were hindered by the ice about six miles from the fishermen and could not maneuver any closer. The aircrew arrived overhead at about 11 a.m. to find the fishermen and their 16-foot boat surrounded by a vast ice shelf consisting of large chunks of ice, some 20-30 feet wide and two-feet thick. Due to the ice coverage, the fishermen had no way to get back to shore. After deciding against hoisting the men up into the helicopter because of a potential to capsize the small boat with the helicopter’s rotor wash, the aircrew lowered a radio down to the fishermen to communicate another plan of action. It was then that the aircrew saw the ice beginning to part and break up from the rotor wash. The aircrew continued to hover between 50-80 feet above the ice for about 45 minutes, maneuvering the craft so that the rotor wash could create an open path for the fisherman to finally head to shore. The fishermen made their way safely back to shore where they were met by Chief Petty Officer Eli Paquette, officer-in-charge of Coast Guard Station Holland. By this time, the men and their small fishing boat had been taken almost two miles north from where they began fishing. Both men were in good condition and were not in need of any medical condition. The Coast Guard reminds everyone that there is still a presence of ice on Lake Michigan that can easily be blown in different directions by the wind. As a result, people on the water can find themselves in life-threatening situations very quickly. Those who must venture out onto the water should check the weather conditions, particularly the wind speed and direction, dress for the water temperature and not the air temperature, and always were a life jacket. Saving Lives and Guarding the Coast Since 1790. 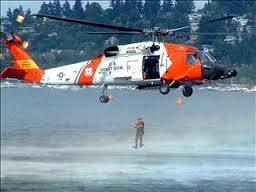 The United States Coast Guard -- Proud History. Powerful Future.